Army Spc. Toby Olsen - Run for the Fallen New Hampshire, Inc.
28, of Manchester, NH; died when an improvised explosive device detonated near his Humvee in Karma, Iraq. 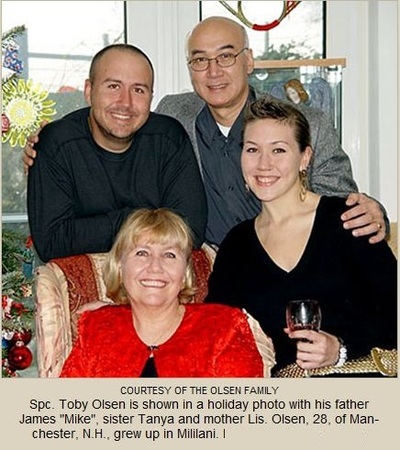 Toby was born in Maryland to James and Lis Olsen. As his father, Army Col. James “Mike” Olsen was an ophthalmologist in the Army, the family moved and lived in various places but their roots were in Hawaii. Grandparents, aunts, uncles, also lived in Hawaii. Around 1991, the family was able to move there, when Col. Olsen was assigned to Tripler Army Medical Center in Honolulu. 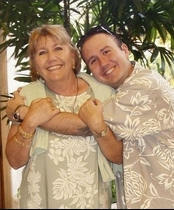 Toby went to middle school and high school in Hawaii, graduating from Mililani High School in 1997. He had a keen interest in art, was a naturally gifted artist and also played in the school marching band. He pursued his interest in art attending Savannah College of Art and Design in Georgia where he graduated with a Bachelor of Fine Arts degree in 2003. He planned to return to Hawaii to teach art. Toby was living in Manchester NH with a friend, when he enlisted in the US Army 2004. His uncle Robert Olsen recalls, "We couldn't understand him taking the path (the Army). He was trying to make ends meet; it was something to give him a further education." "He was reserved, but when he knew you, a friendly, witty guy. He was more of an artist, poet, philosopher," said Robert. "I am an artist, I strive to create and enjoy almost nothing more than to sit having all the time and freedom in the world and create," Olsen wrote. "I hit a point in life though, where my art wasn't fulfilling anymore, it felt empty." So, with a feeling that he had too much freedom, he wrote, he joined the Army. "Now my time is run by the minute, there is almost no room for creativity. I now conform to ideas instead of imagine, and destroy instead of create," he wrote. "The contrast thus far has led to a strong resurgence of my former drives and desire to create as well as a newfound level of respect for the freedoms I once had. "Hope I live long enough to enjoy them again." Toby, CPL Dustin Donica, and SPC Brian White were great Army buddies at Fort Richardson, AK, even before they deployed together as members of Able Company to fight in Operation Iraqi Freedom. The three friends even shared a storage locker in Anchorage, AK during their deployment. Tragically, while Toby was on Christmas leave, his friend Dustin was killed by sniper fire (12/28/06) as he ran to the aid of another parachute platoon that had come under fire while restoring fortifications at a base abandoned by Iraqi forces at Karmah in Iraq’s al-Anbar province. Only 22 days later, on January 20, 2007, Toby was killed when an IED explosion hit the Humvee he was riding in. His friend Spc. Brian White was the only survivor. Fellow Able Company soldiers, Sgt. Sean Fennerty, Sgt. Phillip McNeill and Spc. Jeffrey Bisson were also killed in explosion. Toby’s uncle, Dr. John Olsen, at Brooks Army Medical Center in San Antonio said, "Toby was a great kid, he hung out with a bunch of great guys in the 3/509th Parachute Infantry Regiment." "He hid his fears and concerns from his parents well," his father said. The family is proud of his achievements in the Army, passing airborne training, becoming a top marksman and getting in tip-top shape to do so. He put his heart into any challenge. He’s remembered by his family as a gift artist, a marching-band aficionado, bass guitarist hanging out at a Wahiawa cafe, a former tattoo artist and sculptor, and a die-hard fan of singer Tom Waits. *If you have any information on Toby’s awards and decorations, please contact us. 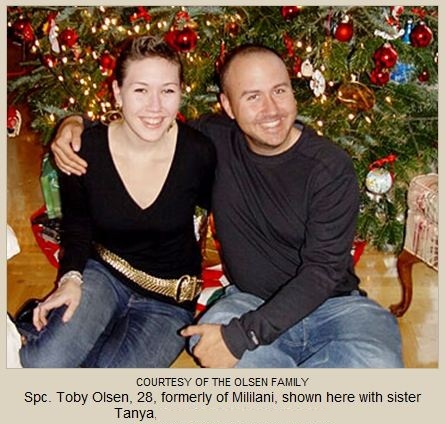 Toby is survived by his parents, James and Lis Olsen, brother Michael and sister Tanya and his extended family.